When I begun the building I kept good pace. To be able to store food and equipment I had designed the boat wide and high. This was contrary to my conviction. After three years it turned out that when I worked against my conviction I was not very productive. My motivation decreased more and more. I had been naïve when I started the project. I had never dealt with sail races and records before. Certainly, I had read in boat books and boat magazines how one could manipulate measurements rules in the same way that rich companies manipulate taxes so that they pay zero taxes although they actually earn billions. I had read about how boats had won races, despite passing the finishing line long time after the first boats, thanks to more advantageous measurements. I had seen it as another sign of the world’s falsehood, but ignored it since I did not race myself. But, as I now had entered the record hunt myself, and as I continued the construction and became more familiar with my project, I, too, started thinking about loopholes. When I started building the boat it was obvious that her length was to be measured between her two extremes. This is strangely enough not the usual approach, rather the opposite. Authorities such as the US Coast Guard, the European Recreational Craft Directive’s harmonized rules, the International Towing Tank Conference, the Nordic Boat Standard and other recognized authorities exclude bowsprits, rudders, screwed-on pulpits and bath platforms from the measured length. Rudders, as mentioned, are not included in the length, but they are displacing. “Why not build a 1.5 meter long, displacing, streamlined, integrated, giant rudder with lots of storage space. Nothing prevents it from having a trim tab that you can easily steer with. Then you would get a boat that in fact is 15 feet long, but according to most of the authorities’ accepted measurements, it would only be ten feet long,” an inner voice from some obscure part of the brain kept tempting me. Having had the thought, it was impossible to get rid of it. I was split. On the one hand, of course, I wanted a boat that gave me as much of a chance as possible, on the other hand, I wanted to stay honest. The project no longer felt real. My thoughts began to wander and found their way toward a low-energy boat. The now so hated ten-footer was an eye-opener. She had made me think deeper and break with traditions. The world is too complicated for us to have time to go back to the fundamental principles for every issue. The thoughts outlined above were thoughts that were spinning around in my head while I was reluctantly working on completing the ten-footer. I realized how absurd and morally wrong it would be to sail around the world in a wide, high, ten-footer, even if it would help to secure my future. I thought, oh my God, what am I doing? I don’t know how doped athletes think, but if I were to succeed with my ten-foot project, I would never be able to enjoy the victory because it was based on false pretenses. On Friday, April 17, 2015 at seven o’clock in the evening, to save my soul, I picked up the tiger saw and cut the colossus to pieces. 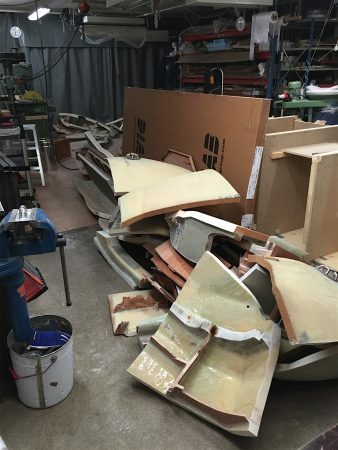 Next Monday, with the help of some friends, I took the pieces to the dump. 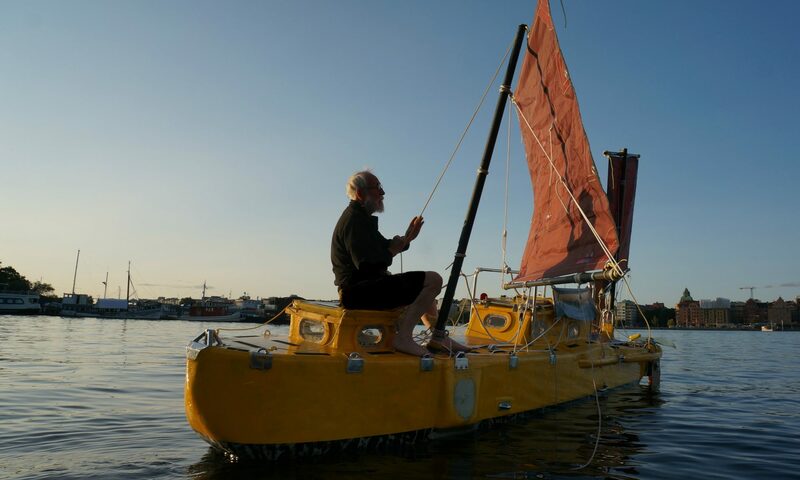 The three and a half years of thinking and constructing this boat had not been in vain. 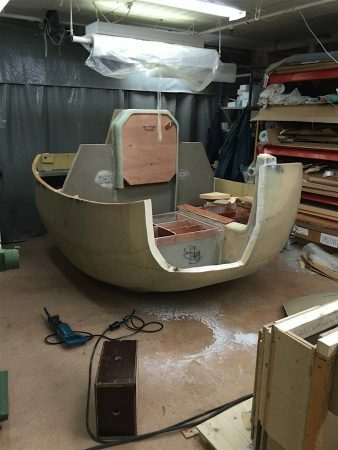 The project had motivated me to further dig into the fundamental principles underlying boat construction. The foundations had brought me good ideas and given me a jumpstart into the future. Life became bright again.